A number of forces, technical and economic, are conspiring to unseat the internal combustion engine (ICE) as the prime mover for transportation. The future powering of China and India looks more electric, efficient and urban, stranding ICE vehicles and oil product demand with it. The internal combustion engine (ICE) won the original battle with electric vehicles (EVs) in 1900-1910, but in the grand arc of history, this may be only a 100 year lead in a much longer race. There are about 900 million passenger cars and light-duty trucks on the road worldwide – most of which are gasoline or diesel powered. On top of this, the automobile industry sells about 75-80million new ICE cars a year. This number is increasing, but only by about 1-2 million cars a year, mostly from growth in India and China as sales plateau in many other OECD countries. And now, as ICE vehicle growth momentum tails off, electric vehicles have re-entered the market after a 100-year hiatus. The re-emergence of EVs is due to several reasons, but three are key: global policies toward lower emissions and fuel efficiency, Chinese and Indian transportation strategies to solve air quality problems in urban centres and avoid fossil fuel dependence, and the investment in EV technology from Tesla and others driving down EV costs, forcing incumbent car producers to react. This is especially problematic for future ICE projections, as the presumed growth engines, China and India, look set to pivot strongly towards electric vehicles to avoid a long-term dependency on fuel imports for transportation. As a result, sales of EVs have risen to almost 1 million new units per year from practically zero ten years ago. With growth rates still remaining high (and highest in China), at over 50% pa, this means that sales of 2m EV cars will happen in the next year or two. Assuming, reasonably, that most EVs displace a conventional new ICE vehicle purchase, by 2017-2018 the annual growth in new ICE car sales will be cancelled out, stalled, and ICE vehicles will start a long-term sales decline as EV sales increase. Many observers will point out that EVs represent a vanishingly small percentage of the world-wide car market. That is true today – but its also history, and not looking at the shape of the incremental forward demand curves. Today’s EV high growth rates can’t last forever, but sustained annual growth rates of over 20-25% for some time are feasible. We can use various projections – the ones below are a slightly more aggressive version than that of Bloomberg New Energy Finance (BNEF),, by assuming that by 2030 50% of all new cars sold are EVs and by 2035, EVs hit 80% of new sales. That forward ICE growth line looks terminal. If your prime market is ICE cars only, you are facing a world of mature, globally-installed competition vying for a diminishing stream of revenue. However, the rise of the EV curve presents great opportunity – and a great threat too, especially if your competitors react to it quicker and more effectively than you do. 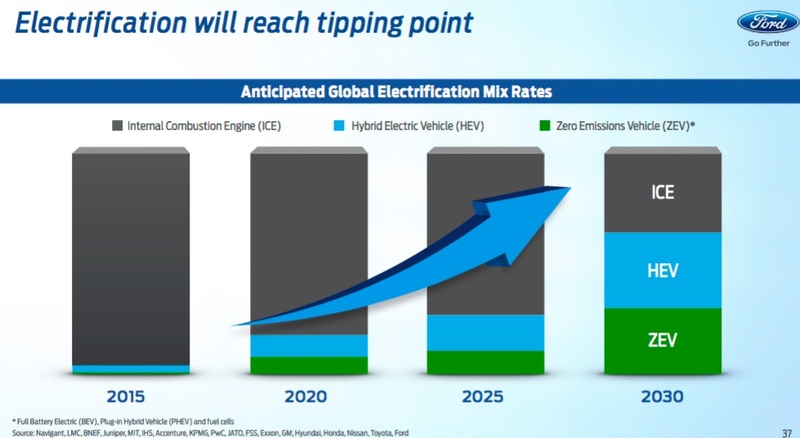 Although this is a schematic, if we take the proportions seriously Ford is calculating about 60% of vehicle sales will be HEV (hybrid EVs) or ZEVs (zero-emission EVs) by 2030. Irrespective of the precise numbers, and hybrid / plug-in hybrid ratios, the general trend is now clearly causing a strategic shift in car industry investment and priorities. The car industry has clearly observed the threat in the decline of the ICE curve, and the opportunity of the EV growth. To a certain extent, Tesla’s work may be done, having completed the heavy technical lifting and showing the auto industry that EVs can be built effectively, and force consumer demand. So, like the internet, although the revitalised EV market has been dominated by start-ups such as Tesla, the established players have moved quickly to regain leadership. In 2016 alone Ford, GM, VW BMW and this example from Daimler-Benz, have announced a combined $5-6bn per annum investment in EV developments (power-trains, infrastructure and so on) over the next 4 years. This outlay is about 20% of total capex, and the auto-makers are also noting that near-term profits may be hit as they ramp up business investment. Why do they need to do this? 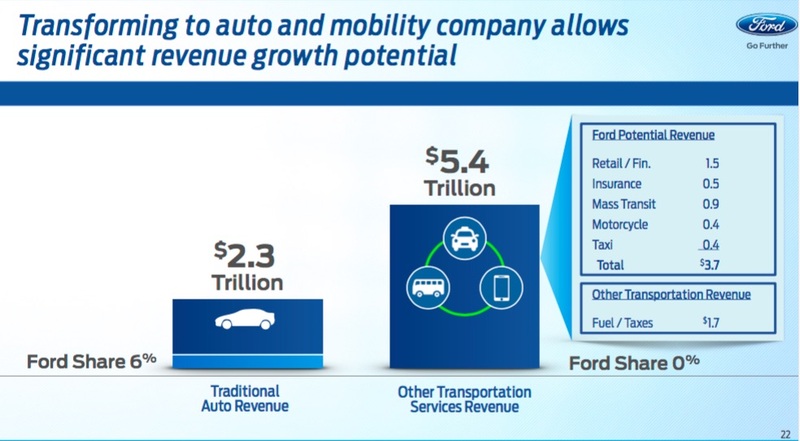 Here is Ford again, speaking to analysts: stay at 6% of a flat or declining market, or take leadership in the world of mobility and transportation services – which they view as double the size of the traditional one, and in which they currently have 0% market share. It’s feasible that Ford and others could move into the new autonomous vehicle and mobility market with ICE cars, but grid-powered vehicles offer running cost, connectivity and urban air cleanliness benefits that make them much more flexible and adaptable to a services-based model. More suited that is to a developing world market, with air pollution and traffic density issues, and where new vehicle growth is highest. The standard ICE vehicle is likely to become more of a stand-alone, standard sales model: less urban, less connected, and likely an increasingly stranded asset as the market for re-sale declines. All this makes an important point: EV cars will not merely replace ICE cars one for one, which is OK in itself. They open the door to a larger, more service-dominated offer, which is why it is attractive to incumbent auto-makers. 20% of auto-industry capex and blllions of dollars of annual investment is a serious exercise in re-tooling, not experimentation. In 2010 there were 5 commercial EV models, there are now over 100 EV brands on the market, and in 2020 there will be over 200. . Many EV models are new Chinese brands such as BYD, and some are novel US marques such as Tesla. But increasingly EVs are the conversion of existing ICE brands to electric versions. The three main remaining obstacles to rapid EV adoption are battery weight and range, vehicle cost and charging. Most of the car industry’s investment dollars, and those of their suppliers, are now going into solving these issues, quickly. Battery weight and costs was the nemesis of the EV back in 1900, so the industry has had almost 120 years to fix this. Today, batteries form about 30% of total vehicle cost, but this is declining fast. A recent review by Goldman Sachs forecasts that battery weight and costs will reduce by 50-60% over the next five years, and range will increase by 50% to over a 275km average. Latest forecasts are more aggressive than this – always a feature of manufacturing curves in the high-growth phase. The key point here is that once major firms in a large market aim their investments on an engineering issue, the power laws of manufacturing improvements kick-in. And note – the cost and range cost improvements won’t stop in 2020 – they will keep on going. Experience curves can’t sleep. With battery performance improving quickly, the major manufacturers will be confident that reliable, long-range EVs will be available to the market rapidly. After all, an EV has less 65% less components than a traditional ICE vehicle, making manufacturing a far simpler process. 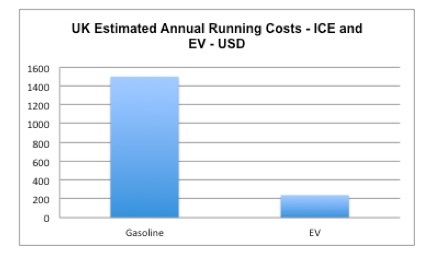 At current rates of improvement in all areas of cost we can assume, as in BNEF forecasts, that EVs will cost the same as ICE cars more or less now, especially when incentives and fuel running costs (close to zero) are taken into account. In fact, GM has just started to offer their their premier EV brand the Chevrolet Bolt for under $30,000 after tax breaks, a critical price point for mass market sales. From a consumer point of view, re-fuelling anxiety may well pass to the gasoline world by 2020. 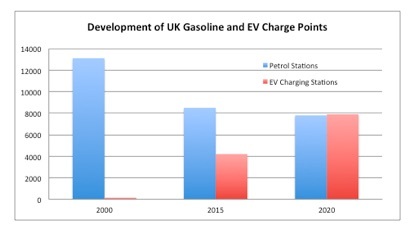 A look at trends in the UK market for example, forecast that by 2020 EV charging points will outnumber gasoline stations. In London they already do. Similar trends are evident across Europe and China, where expenditure on EV grid infrastructure is a relatively small investment to ensure access to EV charging – individual charging piles costing in the region of $15-30,000. Less restricted by safety regulations governing flammable fuel storage, and the unintegrated nature of the industry, electric charge stations are growing quickly in breadth and density. Public car parks, corporate car parks, town squares, supermarkets, home – all are viable locations for car charging. Few are feasible for more gasoline service stations. As a result, there is now about 1 charge point for every 15 EVs in the UK – versus 1 gasoline station for every 4,000 cars. Of course, not every charge point can deliver the fast fuel delivery of a gasoline pump. But the technology needed to improve this is not complicated, and will improve as EV numbers make it economically attractive to invest in faster charging technologies. In sum, manufacturing experience curves, allied with substantial automobile producer investment, has more or less already eradicated the main obstacles to widespread EV adoption. The widespread economic and social impact of a rapid rise in EV adoption has been covered recently by Bloomberg New Energy Finance in some detail. This section will deal in detail with how it may affect the oil industry via major disruptions to gasoline demand. The oil industry views this world of pervasive EV uptake very differently, and resists its claims. But they may be relatively powerless to prevent it. Thus, BP and other oil majors, project an alternative reality. In BP’s latest forecast regarding EVs and oil demand, EV fleet growth is a non-starter – their view is that it takes until 2035 to reach a fleet size of EVs – 70 million – that Ford projects might occur around 12 years earlier in 2023. Chevron and Exxon Exxon have similar views. Oil’s reluctance to countenance rapid EV growth is not unexpected: the fading of the ICE age is an existential problem for them. 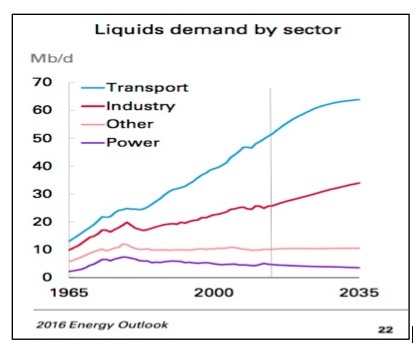 Over 50% of oil’s future demand is projected to come from transportation – see chart from BP (note the optimistic upswing in Industry demand is mostly due to NGLs for petrochemicals, not crude oil). How this actually plays out is therefore a major concern for the industry. As BP’s analysis shows, all the future growth in oil demand is based on non-OECD (China and Indian) demand. If that demand is reduced due to EV penetration, every part of the calculation above is impacted, creating serious consequences for oil demand. The maths is very simple, but is very sensitive to the main assumptions. 900 million ICE vehicles x 14,800 km per vehicle per year x 8.5 litres / 100km – equals 20mb/d (multiplying the three numbers gives you the total global litres of fuel consumed in millions – divide by 365 for the daily rate, and by 160 to get to US barrels). However, projections of oil demand in 2035 using imuch greater penetration of EVs, faster fuel efficiency (outside the US) due to EV competition, and more realistic global driving rates especially for China and India of 7,500km (shown in chart), leads to very different outcomes. 1,150 million x 9,500 km pa x 4.5 litres / 100km – equals 8.5mb/d in 2035, or some 15 mb/d below BP’s projection, and 11.5mb/d below today’s consumption. As noted previously, the EV adoption rate is a more aggressive basis than BNEF’s current 35% of sales by 2040 – it uses 80% of sales as EVs by 2035, and it also assumes that by 2035 90% of the EV fleet is battery or zero-emission, with only a small gasoline demand contribution from plug-in and other hybrids (10% of total ICE usage). This too is quite a disruptive assumption – but it guesses that parallel technologies can’t live side by side forever, and if battery EVs do take off, the implications are very stark for demand. Indeed its a high EV take-off scenario to counter-act the oil industry demand analysis, which may be allowing some subjectivity to creep into the numbers. However, if you don’t quite buy any of the numbers above, plug in your alternatives, and develop your own analysis. Even if marine and air fuel consumption hold up, and these are very mature markets too, this size of hole in oil demand will sink many oil company plans, and OPEC’s ability to control oil pricing. It’s a world that is therefore neither forecast nor contemplated in most oil industry strategies. The chart below of the high EV penetration case summarises the oil demand impact (in Mtoe per annum for consumption just to make the data more readable). 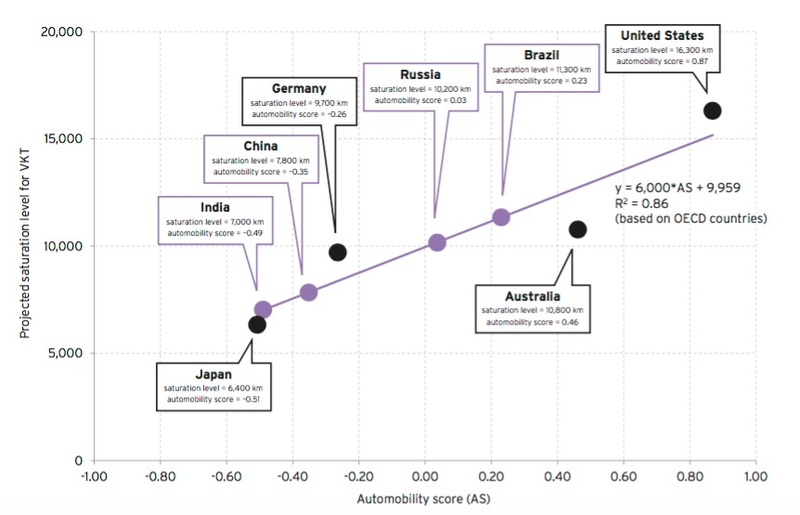 From this chart, the world of transportation oil consumption looks more Chinese and European, than American: less km driven, more urban, more efficient, and lots more EVs, especially if India meets its 100% EV target by 2030. Going forward then, it may be that the US car market is going to be increasingly an outlier. Health and environment-wise, in the high EV penetration case above, this would also roughly reduce CO2 emissions by 2 billion tonnes per year by 2035 versus the full ICE case. The world produced 33 billion tonnes of CO2 in 2015, so that general problem remains, but the shape of the emissions curve is bent lower, and China and Indian cities are more pollution-free. Several European capitals and indeed countries, such as Norway and Germany, are also pursuing ICE-free policies for these, and other, reasons. And indeed, the major car manufacturing companies will strongly encourage this move as the notion of Transportation as a service starts to generate greater revenues and margins. How long some of them continue to produce both ICE and EVs is then a matter of debate. The problem for oil is that it cannot really change the essential nature of its product – it can only watch the diminishing size of its prime demand driver – the ICE – from the sidelines, and hope that uptake is as slow as possible. But the increasing levels of investment and momentum appear to be going the other way, toward EVs. The risks to oil companies seem to be mounting on the downside. The uncertainty over physical demand for their product is one major concern for major oil firms. However, a more immediate one may be the disruption to their commercial models. As noted, the running costs of EVs are only 12% or less of today’s costs to fill up a traditional vehicle. On average, in the UK for example, it costs about $1,500 per year to run a car on fuel. And this is exposed to the vagaries of OPEC’s strategies – see chart. An EV would today cost an equivalent of $250 using 20kWh/100km, saving $1,250 per year – and many places are likely to offer free charging at least for some time. Over the typical ownership lifespan of a vehicle, 7-8 years, this reaches close to $10,000. Oil companies need to recognise that the emergence of EVs also disrupts the way consumers will see the many alternative ways in how you can buy fuel. When petrol consumers see electric car charging is free, and ubiquitous, they will start to ask why is gasoline spot price only, subject to price swings, and only available in a (declining) number of fixed locations. The safety and taxation factors that lead to these outcomes will start to frustrate rather than appease. More generally, EV costs and performance will soon equal ICE equivalents, charge points will proliferate, running costs will drop toward zero. The romance of filling up a car on a wet forecourt, changing oil and using a clutch on a hill-start may not prove enough of a pull to stay with an ICE vehicle. Before long, these issues will put pressure on fuel margins and customer responsiveness, areas where oil companies have limited expertise, and constrained price and margins to work with. If the oil industry does not adapt its selling model, it may cause consumers to accelerate decisions about owning a vehicle that has increasng adaptability and features, a device as much as a car, and near-zero running costs. Long before oil demand displacement fully kicks-in, there is going to be commercial pressure on the oil product sales model. As automobile producers start to place large bets on the EV market growth, and infrastructure, the downside for the oil industry is growing larger month by month. Soon the commercial models will come under strain, then the physical demand. 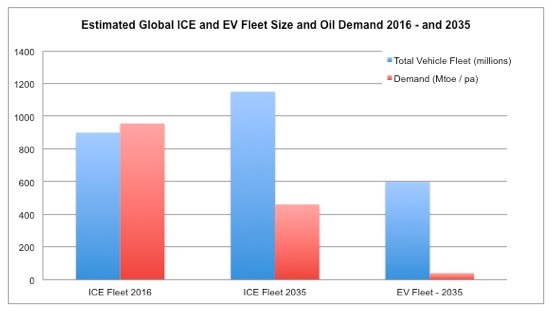 No-one in the automotive supply chain – manufacturers, suppliers and customers – will want to be caught with a stranded ICE asset.In the grand long arc of automotive history, the lead taken by ICE looks to be reducing rapidly. This has benefits to world environment and health, and probably energy innovation as automakers strive to create new mobility services, not just cars. The car and oil industries will certainly be disrupted. So far, it is the car market that is adapting quickest, as it most likely has much more to gain. But the oil sector needs to start adjusting too, and stop just trying to forecast the problem away.